Financial support: Council of Scientific and Industrial Research (C.S.I.R.). A method for immobilization of papain has been selected based on the interaction between its histidine, cysteine and tryptophan residues with the immobilized metal ion (IMI) carrier for maximum binding on a small volume of the carrier. The immobilized papain retained high activity has improved thermal stability and the carrier could be recovered from the spent bound enzyme, to be reused. Reimmobilization of papain on the regenerated matrix was equally effective with the retention of maximum enzyme activity. Keywords: papain, immobilized metal ion (IMI) carrier, immobilization, thermal stability, regeneration of matrix. Numerous approaches have been explored for the preparation of immobilized enzymes because they have considerable advantages over enzymes in bulk solution (Surinenaite et al. 1996; Gomara et al. 2000; Guo and Yang, 2000; Wadu-Mesthrige et al. 2000). Papain, a thiol protease, is well characterized kinetically and structurally (Liu and Hanzlik, 1993; Mellor et al. 1993; Vernet et al. 1995) being a suitable model to compare the efficiency of various immobilization procedures. The need for the immobilization of papain has been due to its great industrial and medicinal potential. For example, papain is used as a chill proofing agent during beer finishing operations in the brewing process (Wiseman, 1993). This enzyme also facilitates the tenderization of meat in the meat industry (Swanson et al. 1992). The potential uses of papain include its frequent use as a biocatalyst for amino acid ester and peptide synthesis (Lozano et al. 1993), as well as the treatment of acute destructive lactation mastitis (Storozhuk et al. 1985). The biopharmaceutical potential of immobilized papain can be well illustrated by the interaction of papain digested HLA class-I molecules with alloreactive cluster of differentiation and cytotoxic-T-lymphocytes in transplantation immunology (Hausmann et al. 1993) and in the treatment of red blood cells with immobilized papain prior to use in antibody-dependent cell-mediated cytotoxicity (ADCC) assays with lymphocytes (Kumpel and Bakacs, 1992). Various attempts have been made to stabilize papain for a more efficient use. Papain and other proteolytic enzymes have been immobilized by radiation polymerization of various monomers (Kumakura and Kaetsu, 1984) and insolubilized by using polyclonal antibodies (Khan and Iqbal, 2000). Covalent coupling of papain has also been shown in different studies performed by several workers (Huckel et al. 1996; Zhuang and Butterfield, 1992). However, the biomatrices with entrapped enzymes tend to leak proteins with time. This resulted in the activity losses as well as contamination of the product with the enzymes, which is not acceptable for pharmaceutical applications. The covalent coupling of enzyme can produce a considerable loss of activity due to the influence of the coupling conditions and to conformational changes in enzyme structure (Goldman et al. 1968). However, irreversible binding of enzyme to the carrier during covalent coupling does not allow the recovery of the carrier from the carrier-enzyme complex (Kise and Hayakawa, 1991; Huckel et al. 1996; Huang et al. 1997). A method is, therefore, needed in which the carrier should be easily regenerated and reused without reducing the immobilization yield. Attempts have been made in this direction and a metal chelate regenerable carrier has been used to immobilize the papain. This immobilization is based on the ability of protein side chains of cysteine, histidine and tryptophan to substitute weakly bonded ligands in the metal complexes. This method has a big potential and may be more versatile since it allows a selection among many chelating metal ions. Papain (lyophilized powder) was obtained from Sigma Chemical Co. USA. Chelating Sepharose was the product of Pharmacia Biotech. Uppsala, Sweden. Casein, cysteine and other chemicals were from Sisco Research Lab., Mumbai, India. Immobilization of papain on metal chelating Sepharose activated by Cu2+ ions. 0.5 mL gel of chelating Sepharose was mixed with 1 mL distilled water and centrifuged for 30 sec. This procedure was repeated four times. The thoroughly washed matrix was loaded with metal ion (Cu2+) by the procedure described in the Instruction bulletin of Pharmacia Biotech, Uppsala, Sweden (1997). Equal volume of matrix (0.5 mL) was mixed with equal volume of 0.4 M CuCl2 (0.5 mL), stirred at room temperature for 30 minutes and centrifuged briefly to discard supernatant. Washing of the matrix was done with 1 mL distilled water four times and finally with 1 mL, 10 mM sodium phosphate buffer pH 8.2. This matrix was mixed with 1.5 mL of papain solution (8.9 mg/mL), stirred at room temperature for 3 hours, centrifuged for 30 sec and supernatant was collected. The matrix was finally washed repeatedly with 1 mL, 10 mM phosphate buffer pH 8.2, until no detectable activity was obtained in the washings. Finally the matrix was suspended in the same buffer. The maximum bound units were calculated by subtracting the activity remaining in supernatant and washings from the units added to chelating Sepharose matrix. The actual units of bound papain were obtained by measuring the activity in the immobilized enzyme suspension. Regeneration of matrix from immobilized papain. 0.5 mL blue coloured enzyme bound matrix was regenerated by suspending in 2 mL eluant (0.05 M EDTA and 0.5M NaCl) for 1 hour at room temperature. It was then centrifuged, supernatant was collected and matrix was washed extensively with 10mM phosphate buffer, pH 8.2. The colourless matrix was resuspended in 0.5 mL of washing buffer and enzyme activity was determined in the collected supernatant, eluant and colourless matrix. The whole matrix was reactivated with Cu2+ ions as described earlier to perform a second cycle of papain immobilization by using the same enzyme concentration. The above procedure was repeated for a total of four cycles. Reimmobilization of papain on regenerated Sepharose activated by Co2+ ions. 0.2mL of regenerated (colorless) matrix was taken and washed with 1mL distilled water (3 times). Supernatant was discarded and matrix was mixed with equal volume (0.2mL) of 0.4M CoCl2. The solution was stirred at room temperature for 30 min., centrifuged, and supernatant was discarded. The matrix was washed twice with 1 mL distilled water and 10 mM phosphate buffer (pH 8.2). Finally, the whole matrix was suspended in 1.0 mL papain solution (8.9 mg/mL). The same procedure was followed as outlined in the section "Papain immobilization on Cu2+ activated chelating Sepharose matrix". The matrix was resuspended in 0.8mL of same washing buffer. The assay for enzyme activity was done in supernatant, washings, matrix and stock enzyme solution as described below. Enzyme assay. The activity of soluble papain was determined by the method of Kunitz as described by others (Keay and Wildi, 1970) using casein as substrate at 37ºC and pH 8.2. The enzyme activity of immobilized papain was determined in a similar manner except that the reaction mixture was continuously stirred during the reaction. One unit of enzyme activity is the amount of enzyme, which produces TCA soluble peptides or amino acids giving a blue colour equivalent to that of 0.5mg tyrosine per minute at 37ºC. The activity yield remaining after immobilization was defined as Activity yield (%) = C/Ax 100 and Immobilization yield (%) = A- B/Ax 100 where A is the total activity of enzyme added in the initial immobilization solution; B, the activity of the residual enzyme in the immobilization and washing solutions after the immobilization procedure; and C, the activity of the immobilized enzyme. The results of the immobilization of papain on chelating Sepharose activated with Cu (II) ions are summarized in Table 1. As evident from the table, the activity and immobilization yields were 78% and 98% respectively, which were significantly higher when compared to the covalently coupled papain (Zhuang and Butterfield, 1992). The activity and immobilization yields of covalently coupled papain were only 6% and 10.5% respectively in a study performed by Zhuang and Butterfield, 1992. Goldstein et al. 1970, have shown that different water insoluble derivatives of papain prepared by selecting polyfunctional diazotizable resins exhibited only 25 to 50% activity yields. In our study, the high activity yield of immobilized papain (Table 1) suggests for an easy accessibility of enzyme for its substrate. Glycoproteins have also been immobilized on IMI carrier by using Cu (II) ions but this inhibits the biological activity of certain proteins and only a limited number of proteins could be used on these carriers (Chaga, 1994). There was no considerable loss of biological activity of immobilized papain due to Cu(II) ions as evident by high activity yield (Table 1). Therefore, this carrier and metal ion are considered suitable for papain immobilization. A remarkable advantage of these carriers is its regeneration and recovery from spent immobilized enzyme. After the elution of papain from Cu (II) activated IMI carrier, the regeneration and reactivation with same metal ion was highly effective as evident by the activity yield of immobilized papain during subsequent cycles of reimmobilization (Table 1). The activity yields for 2nd, 3rd and 4th cycles were 75, 72 and 74% respectively. This clearly indicates that the matrix can be efficiently regenerated, which is not possible in the case of covalently and cross-linked preparations (Iqbal and Saleemuddin, 1983a; Iqbal and Saleemuddin, 1983b). The potential of substituting the metal ion and higher enzyme loading was also investigated on the recovered carrier. In a different set of experiments Co (II) was used for the reactivation of the regenerated matrix obtained from Cu(II) activated papain bound IMI carrier. The results are shown in Table 2. As evident from the table, the activity yield was comparable with the values of Table 1, where fresh as well as regenerated carrier was activated with Cu (II) ions, suggesting that metal replacement is feasible and effective for enzyme immobilization on IMI carrier. Such replacement of metal ion is essential in certain cases, where enzymes are inactivated by binding to specific types of metal ion bound to IMI carrier (Chaga 1994). The similar activity yield at two different enzyme loadings (Table 1 and Table 2) suggests for equal accessibility of enzyme molecules to the substrate indicating that the bound enzyme being held in a favourable orientation or location. Wasserman et al. (1981) have demonstrated that even with a nonporous matrix, the lower activity yield was achieved at high enzyme binding levels. The immobilization yield shown in Table 2 was 90% which was lower than the values obtained in Table 1 and such decrease in the immobilization yield (Table 2) could be due to higher enzyme units loaded on matrix for immobilization. The thermal stability of soluble and immobilized papain was examined by heating at 65ºC for longer duration. 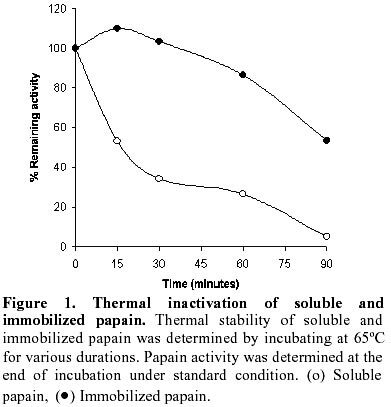 As shown in Figure 1, the immobilized papain exhibited a marked increase in thermostability and retained 87% of its original activity after 1 hour incubation at 65ºC, while its soluble counterpart lost almost 75% of its original activity. The higher stability of the IMI bound papain could be due to the diminished autolysis of the enzyme fixed to the support. The second possible explanation is related to the rigidity of the conformation of the enzyme molecules resulting from binding to the matrix. Most proteolytic enzymes studied in their soluble form are highly susceptible to autolysis and get inactivated at elevated temperatures (Zhuang and Butterfield, 1992). The enhancement in thermal stability of membrane bound papain and covalently coupled chymotrypsin has also been reported in many other enzyme immobilization studies (Butterfield et al. 1994; Schnapp and Shalitin, 1976). The cost of the carriers used for industrial applications is very important. The regenerability of IMI carrier is, therefore, relevant. The mild conditions used for papain immobilization, the high recovery of immobilized preparations and the regenerability of the matrix are the main features of the method reported here. The financial support from Council of Scientific and Industrial Research (C.S.I.R.) in the form of grant is highly acknowledged. Butterfield, D.A. ; Lee, J.; Ganapathi, S. and Bhattacharyya, D. (1994). Bifunctional membrane Part IV. Active site structure and stability of an immobilized enzyme, papain, on modified polysulfone membranes studied by electron paramagnetic resonance and kinetics. Journal of Membrane Science 91:47-64. Chaga, G. (1994). A general method for immobilization of glycoproteins on regenerable immobilized metal ion carriers: Application to glucose oxidase from pencillium chrysogenum and horseradish peroxidase. Biotechnology and Applied Biochemistry 20:43-53. Goldman, R.; Kadam, O.; Silman, I.H. ; Caplan, S.R. and Katchalski, E. (1968). Papain-colloidion membrane. I preparations and properties. Biochemistry 7:486-500. Goldstein, L.; Pecht, M.; Blumberg, D.A. and Levin, Y. (1970). Water-insoluble enzymes. Synthesis of a new carrier and its utilization for preparation of insoluble derivatives of papain, trypsin and subtilopeptidase A. Biochemistry 9:2322-2333. Gomara, M.J.; Ercilla, G.; Alsima, M.A. and Haro, I. (2000). Assessment of synthetic peotides for hepatitis A diagnosis using biosensor technology. Journal of Immunological Methods 246:13-24. Guo, L.H. and Yang, S.K. (2000). Study on the gallic acid preparation by using immobilized tannase from Aspergillus niger. Shen Wu Gong Chang Xue Bao 16:614-617. Hausmann, R.; Zavazava, N.; Steinmann, J. and Muller-Ruchholtz, W. (1993). Interaction of papain-digested HCA class I molecules with human alloreactive cytotoxic T lymphocytes (CTL). Clinical and Experimental Immunology 91:183-188. Huang, X.L. ; Catignani, G.L. and Swaisgood, H.E. (1997). Comparison of the properties of trypsin immobilized on 2 celite derivatives. Journal of Biotechnology 53:21-27. Huckel, M., Wirth, H.J. and Hearn, M.T. (1996) Porous Zirconia: a new support material for enzyme immobilization. Journal of Biochemical and Biophysical Methods 31:165-179. Instruction bulletin of Pharmacia Biotech (1997). Chelating Sepharose fast flow instructions. TK1, Uppsala, Sweden. pp. 1-20. Iqbal, J. and Saleemuddin, M. (1983a). Preparation and properties of Con A cellulose immobilized glucose oxidase. Indian Journal of Biochemistry and Biophysics 20:33-38. Iqbal, J. and Saleemuddin, M. (1983b). Activity and stability of glucose oxidase and invertase immobilized on concanavalin A Sepharose: Influence of lectin concentration. Biotechnology and Bioengineering 25:3191-3195. Keay, A.J. and Wildi, B.S. (1970). Proteases of the genus Bacillus. I Neutral proteases. Biotechnology and Bioengineering 12:179-212. Khan, S.A. and Iqbal, J. (2000).Polyclonal antibody-mediated insolubilization and stabilization of papain. Biotechnology and Applied Biochemistry 32:89-94. Kise, H. and Hayakawa, A. (1991). Immobilization of proteases to porous chitosan beads and their catalysis for ester and peptide synthesis in organic solvents. Enzyme and Microbial Technology 13:584-588. Kumakura, M. and Kaetsu, I. (1984). Behaviour of enzyme activity in immobilized proteases. International Journal of Biochemistry. 16:1159-1161. Kumpel, B.M. and Bakacs, T. (1992). Comparison of lysis of bromelin and papain treated red cells in ADCC assays. Immunology Letters 31:237-240. Liu, S. and Hanzlik, R.P. (1993). The contribution on intermolecular hydrogen bonding to the kinetic specificity of papain. Biochemica et Biophysica Acta 1158:264-272. Lozano, P.; Cano, J.; Iborra, J.L. and Manjon, A. (1993). Influence of polyhydroxylic cosolvents on papain thermostability. Enzyme and Microbial Technology 15:868-873. Mellor, G.W. ; Thomas, E.W. ; Topham, C.M. and Brocklehurst, K. (1993). Ionization characterstics of the cys-25/His-159 and of the modulatory group of papain: resolution of ambiguity by electronic perturbation of the quasi-2 mercaptopyridine leaving group in a new pyrimidyl disulfide reactivity probe. Biochemical Journal 290:289-296. Schnapp, J. and Shalitin, Y. (1976). Immobilization of enzymes by covalent binding to amine supports via cyanogens bromide activation. Biochemical and Biophysical Research Communications 70:8-14. Storozhuk, V.T. ; Shamolina, I.I. and Lobova, A.B. (1985). Immobilized papain in the treatment of acute destructive lactation mastitis. Vestn. Khir Im II Grek 135:42-46. Surinenaite, B.R. ; Bendikene, V.G. and Iuodka, B.A. (1996). Immobilization of enzymes on carriers with magnetic properties: the search for optimum conditions for immobilization of alkaline phosphatase from the chicken graft. Prikl. Biokhim. Mikrobiol. 32:609-614. Swanson, M.C. ; Boiano, J.M. ; Galson, S.K. ; Grauvogel, L.W. and Reed, C.E. (1992). Immunochemical quantification and particle size distribution of airborn papain in a meat portioning facility. American Industrial Hygiene Association Journal 53:1-5. Vernet, T.; Tessier, D.C.; Chatellier, J.; Plouffe, C.; Lee, T.S. ; Thomas, D.Y. ; Storer, A.C. and Menard, R. (1995). Processing of the papain precursor. The ionization state of a conserved amino acid motif within the proregion participates in the regulation of intramolecular processing. Journal of Biological Chemistry 27:16645-16652. Wadu-Mesthrige, K.; Amro, N.A. and Liu, G.Y. (2000). Immobilization of proteins on self-assembled monolayers. Scanning 22:380-388. Wasserman, B.P. ; Jacobson, B.S. and Hultin, H.O. (1981). Explanation of anamolous binding kinetics with a high yield immobilized enzyme system. Biochemica et Biophysica Acta 657:52-57. Wiseman, A. (1993). Designer enzyme and cell applications in industry and in environmental monitoring. 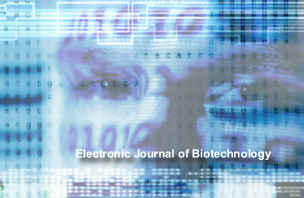 Journal of Chemical Technology and Biotechnology 56:3-13. Zhuang, P. and Butterfield, D.A. (1992). Spin labeling and kinetic studies of a membrane immobilized proteolytic enzyme. Biotechnology Progress 8:204-210.